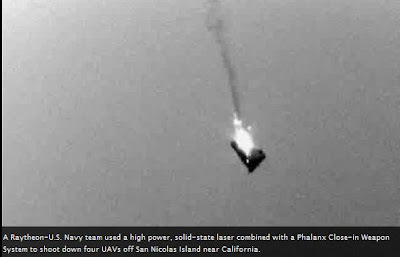 A Raytheon-U.S. Navy team used a high power, solid-state laser combined with a Phalanx Close-in Weapon System to shoot down four Unmanned Ariel Vehicles off San Nicolas Island near California. Powered by electricity, the system offers an affordable and almost infinite magazine to stop incoming threats. Once development is completed, the Laser Area Weapon System will give the warfighter a speed-of-light solution for defeating rockets, mortars, UAVs and other targets. Excellent; soon our capacity to create weapons will only be limited by our skill with acronyms. Sithy another limiting factor will be our ability to build moon sized space stations to house those abbreviated weapons in.